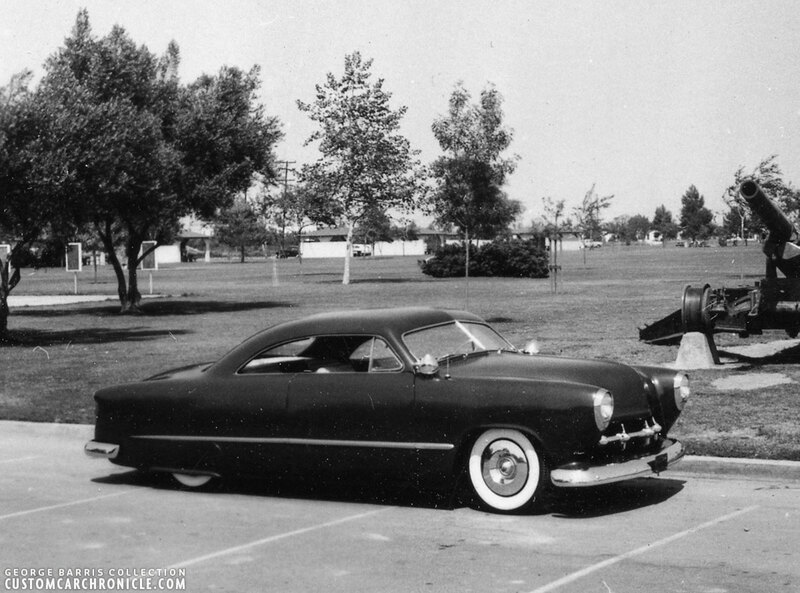 One of the Custom Car Icons the Buster Litton Panoramic Ford has been lost for many decades. Perhaps this new info will lead to the answer to what happened to the Panoramic Ford. With the help of Rob Radcliffe who interviewed Buster Litton and Don Schaedel, original and second owner of the car, about the Barris/Cerny restyled 1949 Panoramic Ford, we have created a two part article here on the CCC in 2015. With all the unique information Rob and me had gathered we were able to get an accurate history on this Iconic ’49 Ford Hard Top written down. We shared some never before seen material that was shared by Buster Litton and Don Schaedel, and were able to trace the history of the car back to 1957. The Panormic Ford when Buster Litton owned the car. In 1957 Don Shaedel, who had owned the car since the early summer of 1954, traded the Hard-topped Ford for a sectioned Shoebox and never sees his beloved custom again. Despite all the efforts we have not been able to find any trace of the cars after 1957… until September 24th 2018. That day I received an email from Claudia, who had seen the articles on the Buster Litton on the Custom Car Chronicle and clearly remembers the car from 1960-62 time frame. At that time Claudia was 12-14 years old she new this guy named Darrel Wienkuaf (Update correct spelling is: Daryl Weinkauf) from Pipestone, Minnesota. Claudia was friends wit Daryl brother Curtis, and she remembered the car here friends older brother had from 1960 till around 1962. She remembered the details on the car clearly, since she really liked it, and remembered the Barris Crest still being on the car, and the hard-topped roof. She has no idea what happened to the car after 1962. I have tried to find out more about Darrel Wienkuaf (as Claudia spelled it) but perhaps it is spelled Weinkauf (which very much sounds like a German name) from Pipestone, Minnesota. But so far I have found nothing. So I hope that perhaps some of our readers know people from that erea, or perhaps know more about a possible car scene in Pipestone, Minnesota or surrounding area in the early 1960’s. Hopefully we can come up with some more info on the Panoramic Ford being owned by Darrel from 1960-62, and possibly what happened to the car after that. 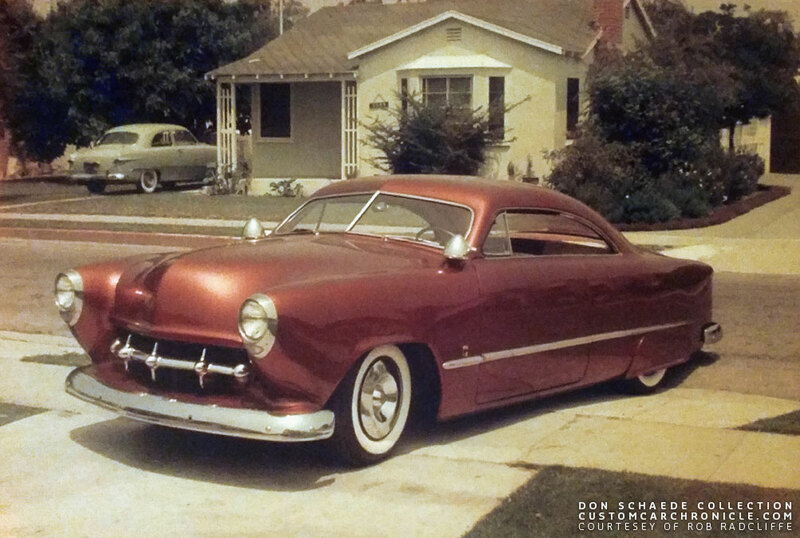 The Panoramic Ford when Don Schaedel’s owned it parked on the drive way at his home in Lynnwood, Ca. Larry Pointer did some digging after reading this article, and this is what he came up with. Daryl Eugene Weinkauf, born 29 July, 1938. Son of Arnold and Hazel, living in Sweet, Pipestone County, Minnesota in 1940, He was listed in the census as about l year old, with a brother, William age 2 1/2. I fount a South Dakota marriage for Darryl and I believe a Janice… 18, September, 1958, in Hughes, Pierre County South Dakota. BUT, a divorce in California from a spouse Janice J., 28 December 1984, San Bernadino. The Find-A-Grave website listed his death, 27 May, 2015, age 76. He is buried in the Riverside National Cemetery, Riverside County, Califorinia. On the Panoramic lead, I found Daryl E Weinkauf on the Camp Pendelton, CA US Marines muster rolls from July 1956 through January 1958. 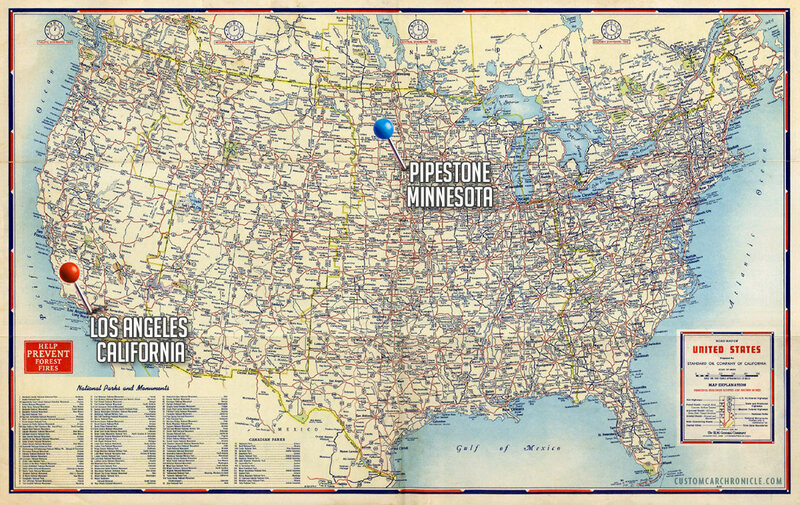 This puts him in California at about the time he could have seen that Panoramic Ford, and then purchased it and took it back to his parents’ home in Pipestone, by the time that your source Claudia would have seen it there. On Instagram Joe Bronco did some digging as well. Joe was able to get in touch with the son of Curtis Weinkauf, the boyfriend Claudia mentioned. The son talked to his father Curtis to ask about the car, and he could not remember much about it at this moment he for sure did not know what happened to the car after his brother sold it. But he would ask as around some more, perhaps some other family members might know more about it. Curtis mentioned that the time frame might be slightly off. So hopefully we will get more input on that as well. At this moment he thought there were no photos of the car, but they will be looking. Hopefully some family snapshot might show it. 1950-1951 first owner Allen Anderson takes his 1949 Ford Coupe to the Barris Kustom shop to have them build a full custom out of the car. Allen requests the top to be chopped and turned into a hard-top style. 1952 Buster Litton buys the unfinished project from Allen Anderson. 1952 Buster hires the Barris shop to finish the started work on the car an has them create the custom grille. 1952 Buster brings the car home after the Baris shop has finished the work and painted the car with primer. 1953 Buster takes the car to George And Carl Cerny’s shop to have them restyle the rear of the car to match the work on the front. 1953 painted in a wonderfull deep coco rust lacquer by Doug Anderson, who worked at the Cerny shop. 1954 adding Ford accessory bumper gards up front and modified Kaiser bar with exhaust thru the bullets on the rear bumper. 1954 February, winning awards at the Motorama and National Roadster Show. 1954 May-June selling/trading the car to Don Schaedel. Don gives Buster his mildly customized 1951 Mercury Convertible in trade for the Ford plus some cash. 1954 Don removes the front Ford Accessory bumper guards since he felt they where to tall for the car. 1957 Don trades the Panoramic Ford for a sectioned Shoebox Ford, and looses track of the Panoramic Ford soon after that. 1957 – 1960 We have no info on where the car was during these years. 1960 – 1962 Daryl Weinkauf from Pipestone, Minnesota owned the car. If anybody knows anything more about Darrel Wienkuaf or Darrel WeinKauf from Pipestone, Minnesota. Or does know anything about a car scene from this area in the early 1960’s. Please let us know. 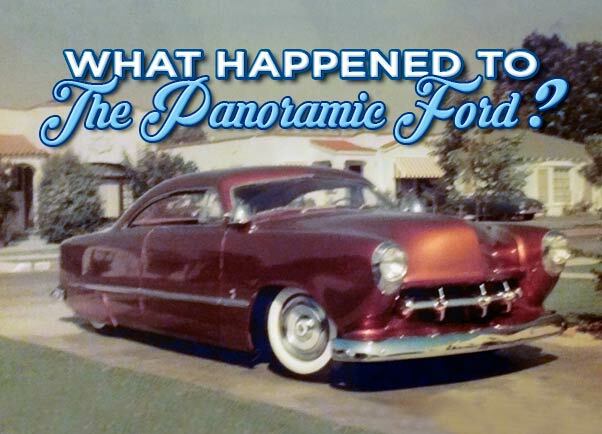 We would love to get in touch with people who know more about the Panoramic Ford during this period, and possibly find out what happened to it. 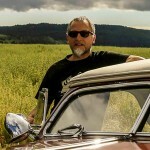 Please Email Rik if you can help us with the search from this long lost Iconic Custom Car. Thank you.